The Urban Initiatives’ Bus Campaign is in full swing following the annual kickoff party held on April 11th. Associate Board members and friends ventured to Goose Island Brewery, which graciously donated their Tap Room, tours of the brewery, and offered five different draft beers to the attendees. Limelight Catering provided delicious brown bag sandwiches for dinner. UI staffer Jordan Lantz gave a presentation highlighting the impact and importance of the bus campaign. Busing is a major cost for UI and it only takes $10 to transport one student to a Work to Play or Take the Lead game day. Friendly competition was also inspired, as a number of prizes for highest individual and team fundraisers were announced. However, as Jordan stated, the real winners of the bus campaign were not present at Goose Island that Tuesday night. The true winners were our Work to Play students at home getting ready for the next day’s lessons in the classroom and on the field. Following the presentation and some quick remarks from UI Executive Director Jim Dower, the party continued on. 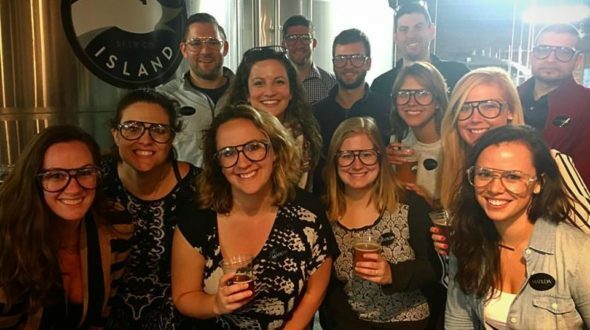 Goose Island provided complimentary tours of their brewing facilities as Associate Board members and friends got to see the inner workings of one of Chicago’s top breweries. UI staff discussed fundraising strategies and ways to get involved with not only the Bus Campaign but also a host of other events such as the Work to Play Cup, Corporate Challenge Cup, and volunteering at game days and practices. Urban Initiatives would like to thank Goose Island Brewery their donations and support toward putting on this stellar event and Limelight Catering for providing a delicious meal. Finally, we would like to thank all AB members and their friends who attended the kickoff party.